Street Photography - What, Why and How? Oddly, it’s not just about taking your camera on the ‘Street’ and clicking away regardless. It’s more about appreciating what you see in front of you, recognising the unusual, appreciating the humorous and downright weird in the everyday, and dismissing categories and pigeon holes, to photograph life as it is seen, raw, unencumbered and in all its nakedness. Street Photography isn’t a new ‘fad’ either. It’s been around for just over 100 years, when the use of small format 35mm cameras become more common. Why is Street photography so often in Black and White, particularly as we have colour vision? If you search for Street photographs on the internet, the results will be predominantly in black and white. Now this may be due to how the search engine works, but of course, most of the archival photography was shot on black and white film before the invention of mass produced colour film. So why do many of today’s Street photographers maintain this tradition? Stripping away colour from our vision, makes us concentrate on the subject, the nuances and content rather than the interplay and effect of colours. Black and White often evokes a nostalgic and halcyon mood of times past. Photographing in Black and White today, is often an emulation and homage to the past styles and processing, for example, adding contrast and grain to create a mood. Some photographers ‘think’ in Black and White when they shoot, so they can visualise the result without colour. Using your camera on the street requires considerable co-ordination, as you will need to ‘see’ things and at the same time frame the shot and press the shutter button. If you’re initially nervous about shooting people and situations, you can try and be less obvious by ‘shooting from the hip’, but this initially takes a lot of practice in pointing the lens at the right height and angle to achieve successful results, without chopping people’s heads or feet off, or missing the shot altogether. Alternatively, some cameras have tilting LCD screens which you can point upwards into your view and see the composition without guessing. This method looks as though you’re just looking down at your camera or making an adjustment. Just like learning to play a musical instrument, good Street photography improves with constant practice. Carry your camera at all times, instinctively know the controls, where they are and importantly what they do, and make the camera your second skin. How do I decide where to shoot? Shoot the scene as it happens. For this you’ll probably always be on the move, so you need constant observation of what’s going on all around you, a high degree of anticipation and razor sharp reactions. You have little control over the background or elements in the shot, so be prepared to lose a few! 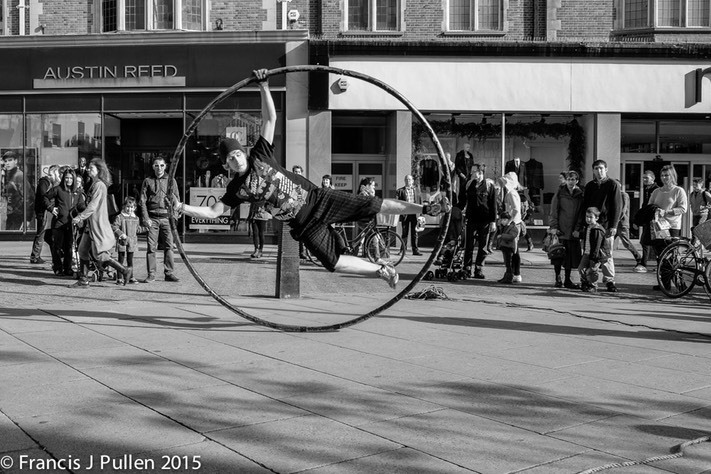 The spinning street performer shot below was taken on the fly as I rounded the corner, so besides being ever prepared for a shot, I also had to anticipate a position that would look good as he turned inside the spinning hoop, frame the shot and press the shutter button, all before he finished his acrobatics! Choose a scene and wait for something to enter it - this is a more considered technique and requires a good deal of patience, but you can control what the background contains as you choose the location, and you can decide those elements which that appear in the frame. The photograph below is known locally as ‘The Resting Bench’, in Bury St Edmunds, Suffolk. To take the shot, I waited some distance away for a few minutes to see who would arrive and if they would then make an interesting composition. 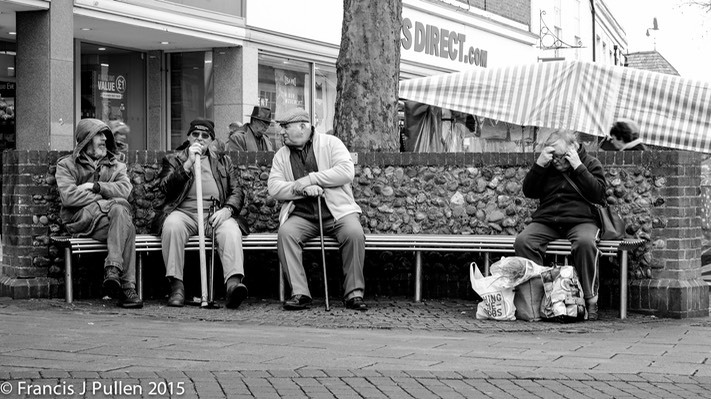 In time, the 3 men sat down with their walking canes and engaged in hearty conversation. A short while later, a lady sat down at the other end of the bench, obviously quite weary from carrying her 3 heavy shopping bags, making a perfect counterpoise to the animated men. Click, and the shot is made. So can I shoot Street in colour? The obvious answer is of course, Yes. Some photographs may need colour which highlights a particular part of the scene, or to draw the viewers attention to it. Some shots just don’t ‘work’ unless they’re in colour, so I shoot both colour and black and white. The shot below of 4 Red Telephone boxes in central Cambridge just wouldn’t ‘work’ in black and white - they are iconically red, they have high impact in red and red is how we expect to see them. The ‘Luck’ element here was that the 6 nurses were on a break from training at Addenbrookes Hospital in the City, and as I was passing by, their colleague was taking a photograph of their antics, so I did the same! I was in the right place at the right time with the right scene and subjects - great fun and action shot. Why has Street photography become more popular? When I’m out photographing, I often hear people say, ’Well everyone’s a photographer now aren’t they’ and to some extent this is true. The phenomenal rise in digital camera ownership and smart phone cameras, gives everyone the opportunity (but not necessarily the skill!) to take a decent photograph with the minimum of equipment. In addition in 2013, cameras from Fuji, Olympus and Sony came to the market which were very light compared to DSLR types, produced very high quality images, had a small footprint, and were virtually silent as they have no mirror like a DLSR, allowing really discrete Street photography, without using a cumbersome DSLR body and long lenses. In the UK, providing you are on public property, you cannot be stopped from taking a photograph, even by the Police. Other countries such as Germany, Italy and the USA have different rules. Some shopping arcades, building frontages and other areas, are often privately owned, so security staff particularly in London, may ask you not to take photographs. Smile, especially if people catch you taking their photograph. Explain why you’re doing so, and offer to send a copy if they would like one. Use your common sense and remain polite at all times. Be respectful - taking photographs of homeless people on the street is just like going on a human safari - don’t do it. Be sensitive to people who may not want their photograph taken, or especially their children, whatever the situation. Don’t object, because just like buses, there’ll be another opportunity come along soon. Avoid photographing at Military and similar Government installations. What’s in your Street camera bag? I use a Fuji X-T2 body and one prime lens, either a 35mm f1.4, or if I want a wider field of view, an 18mm f2, as there is often insufficient time to rotate a zoom lens which would then miss the moment. This combination is also less intrusive and obvious. Street photography is a good place to practice the KISS principle - Keep It Simple Stupid - small, quiet and uncomplicated. My home town is the historic and beautiful University City of Cambridge, which has a hugely diverse population of residents, students and tourists from all around the world, visiting some of the 34 famous University Colleges, Churches, Parks, the Market and to go Punting on the River Cam. This presents endlessly different opportunities for Street photography, which I have been documenting for many years, including the social changes, street performers, fashion, shops, transport, architecture and the people as they go about their daily life. 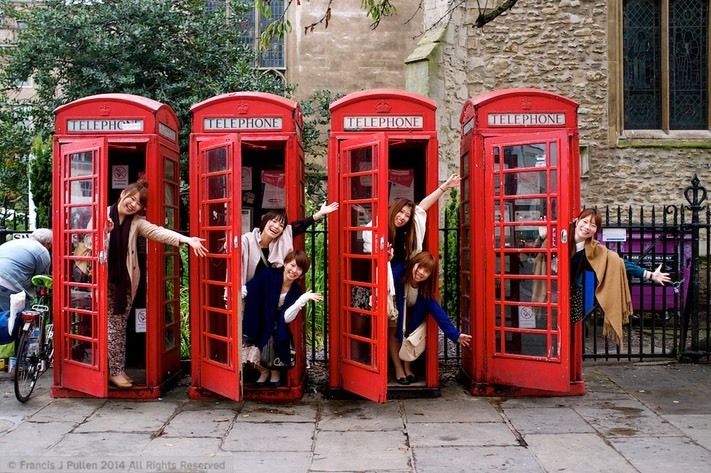 Cambridge is a compact City and ranks as 172nd according to the United Kingdom Census 2011. It has a population of 123,867 (just behind Newcastle-under-Lyme) including 24,488 University students, which themselves are transient and ever-changing in numbers and this all contained in 15.71 square miles, set at just 20 feet above sea level.